Heat the barbecue to hot. Break the tough ends off the asparagus. Mix the asparagus, a good splash of extra virgin olive oil and some sea salt in a bowl. Place asparagus on grill bars. Turn it from time to time to ensure a nice crust forms, and it gets some good grill marks all over. Cook for about 4 minutes. 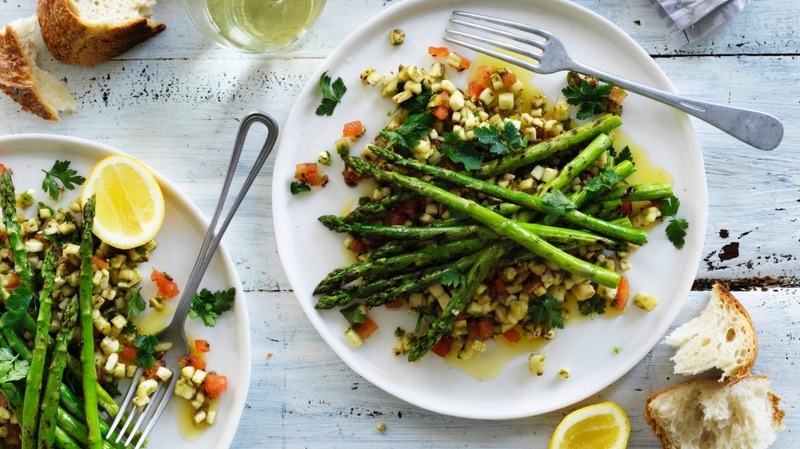 Transfer asparagus to a plate, drizzle with more extra virgin olive oil, sprinkle with sea salt, pour over lemon juice and give a good grind of fresh pepper. Steam eggplant in a steamer for 10 minutes, until soft and tender. Place in a bowl, add all the other salad ingredients, and mix. Spoon the salad in the middle of 4 large plates, then place the asparagus spears across in 4 equal portions. Serve with delicious, crusty bread.